I’m making preparations for an herb garden this year. Again. After two failed attempts, maybe this year will actually yield … something? Anything? The first summer we spent in our house, in 2009, I bought a bunch of herb seeds and a tomato plant over Memorial Day weekend. With no reading, research, or any gardening knowledge whatsoever, I dumped the seeds in some soil in a cheap-o plastic container that I purchased from Home Depot, put it on our deck, and occasionally remembered to water it. And that pot for the tomatoes? I had no idea what size pot I would need for a tomato plant. I just kind of eyeballed it. And did I mention that neither my husband nor I even like tomatoes? I just knew that we now owned a home and it was summer. Isn’t that what you’re supposed to do in the summer when you own a home? Grow tomatoes? Needless to say, nothing grew in 2009. Last year, four years after my first try, I decided to try my hand at gardening again. (Four years? I know. I get distracted easily by other projects). This time I did more research and preparation. I decided to grow seedlings in the house first, and then move them outdoors. Well, by the time my idea for a Summer 2013 garden popped in my head, it was probably already about six weeks too late to start seedlings. I had read that you should plant them about six weeks before the last frost in your area. Our last frost, according to the almanac, is usually mid-April. Which means I should’ve started the seedlings in early March. Well, my idea came in mid-April. But I still decided to progress with an herb garden for the summer. I saw it as a learning experience that even if I didn’t have a very long season of herb yields, I could learn more. Well, I did learn more. A heat mat and germination station. I really should’ve paid closer attention to the description. 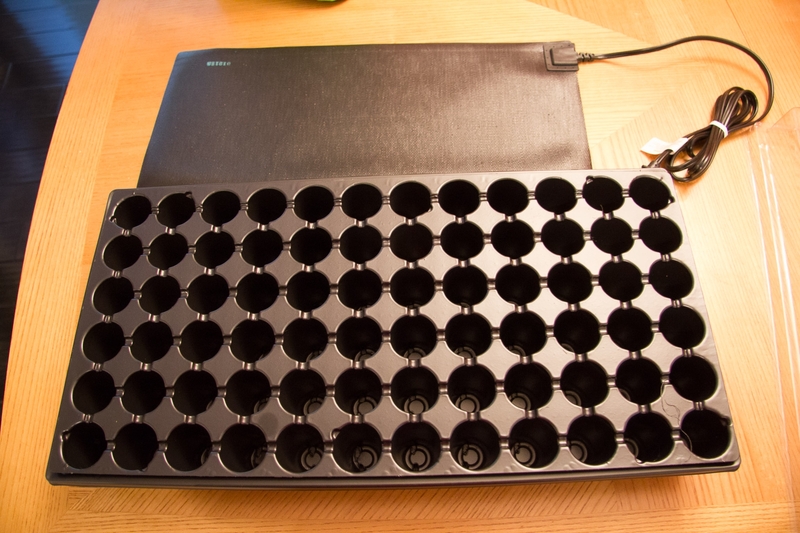 While I love the heat mat, I really, really did not need space for 72 little “pots” in the tray. Herb Seeds I was really tempted to also get a few tomato seeds or other veggies, but I forced myself to keep the experiment small, so as not to get discouraged or overwhelmed. We don’t have a big yard, so container gardening was the way to go. I purchased terra cotta pots from Home Depot that I would eventually transplant the seedlings to. I planted the seeds and waited for the seedlings to grow. So, the experiment started off REALLY well. In fact, I had my first seedlings pop up in just three days! Within two weeks, many of the seedlings were too big for the little “germination station” pots. So, I started transplanting them to the terra cotta pots. In this process, I killed and ruined pretty much every seedling. The little seedling plastic pots were just way too small. And it was SO difficult to get the seedlings out without completely disrupting the roots. Despite disrupting the roots, I continued to transplant them and gave them a few days in their terra cotta pots to see if they would revive. The cilantro lasted, but that was it. I decided that I wanted to restart the experiment, even though it was very late in the season at that point. But this time, I didn’t want to have to transplant anything. So I bought more seeds and fiber “Peat Pots” from Home Depot, similar to these except they were larger and packaged as individual, separate containers. These peat pots are biodegradable, so you can put the entire peat pot in the ground (or in my case the container) when the seedling is ready. In fact, some online reviewers said that the roots will grow right through the sides of the fiber pots. I read that the fiber pots would dry out the soil more quickly, so I watered the seedlings more frequently than I did when they were in the small germination station set. The seedlings grew indoors, and I was ready to transplant them into their pots. (Sorry, I didn’t photograph this process). But there was a problem. The fiber pots never “biodegraded” into the soil. They remained fiber pots all the way through the end of the season. And at some point, the pots must have stunted the herbs’ growth, because they all started to die. I snapped a picture when I started to clean up my container garden in late October (way late, I know). By then, the herbs had already died. 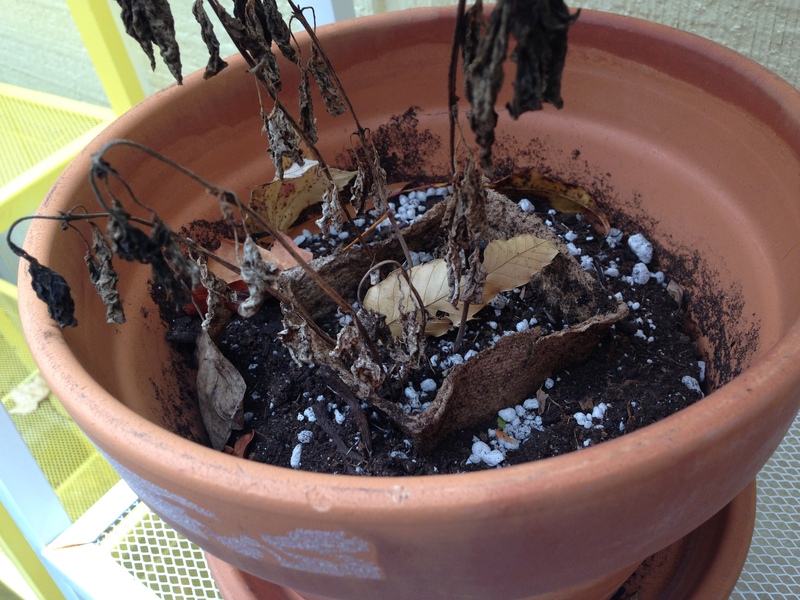 You can see in the picture that the peat pot remains intact, more than five months after being transplanted to a terra cotta container. SO. Where do we go from here after the Great Failed Gardening Attempts of 2009 and 2013? We try again. 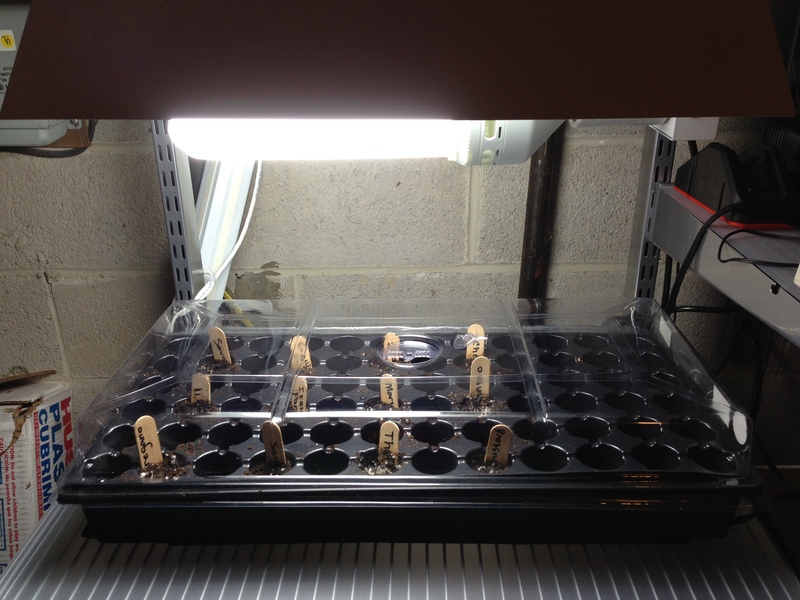 It’s early March, so I’ll be starting the seedlings at a more proper time this year. I’m going to have two starter sets in the hopes that in case one experiment doesn’t work, the other one will. I purchased some coir pellets. These seem to be “more” biodegradable than those fiber peat pots that didn’t work for me. I was reading online that you can actually cut off the biodegradable netting that serves as the “pot” for the seedling before you transplant it. 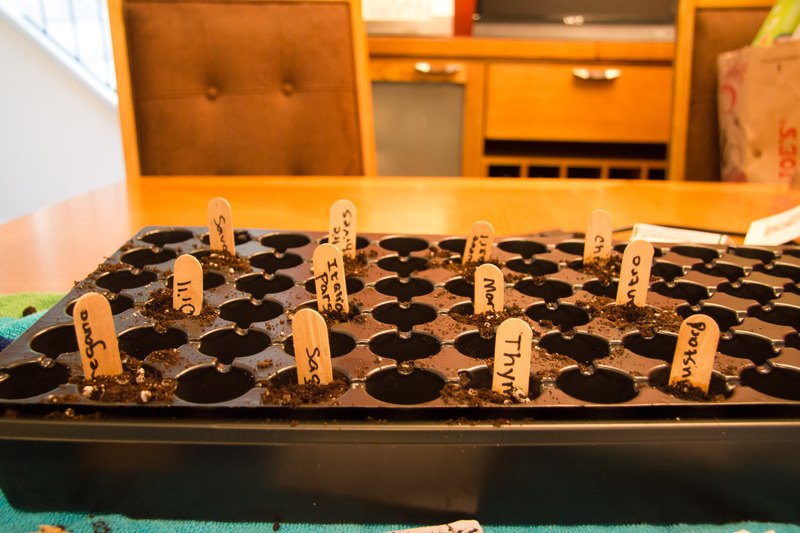 Second, I’m going to plant two sets of herb seeds – one in the coir pellets and one in some Solo plastic cups. It seems fairly straightforward to cut down the side of the Solo cup to free the soil and seedling when it is time for transplanting, which hopefully will be less disruptive than trying to “pop” the seedling up from the bottom of a plastic container, which is how I disrupted the roots and killed so many of the seedlings last year. I’m also going to try a few additional things, such as taking the seedlings outside in the seedling containers for a few days before transplanting them to their new pots to “harden” them up a bit and make the seedlings used to the outdoor climate before switching them to their new pots. What do you think, does that sound like a good approach? Do you think I’ll actually have a yield in my garden following this approach?